LRS staff enjoyed presenting “Data Visualization for the Rest of Us: A Beginner’s Guide” at ALA Midwinter. 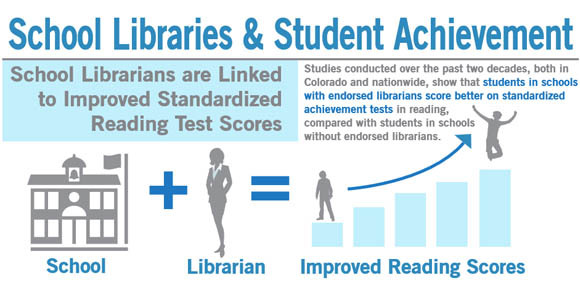 This was an encore presentation from the 2015 Research Institute for Public Libraries. 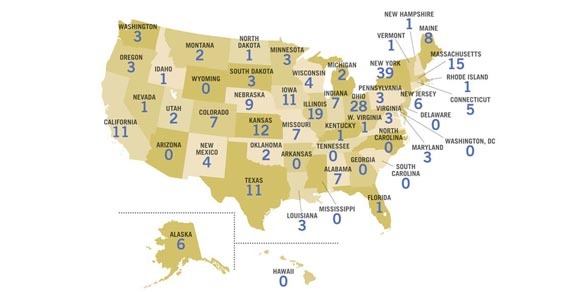 Check out American Libraries’ coverage of the presentation to learn how we got started with data visualization as well as our tips for making numbers and charts more accessible. And, don’t forget – registration for the 2016 Research Institute for Public Libraries opens January 26, 2016! The ebook and audiobook platform Overdrive recently released results from a survey of public library website users that investigated their preferences and use of library resources, in particular print and digital books. More than 16,000 respondents shared their opinions and behaviors to shed light on how public libraries are meeting these users’ needs. More than 2 in 5 (43%) of respondents reported visiting the library—either in person or online—more than once per week, with a total of 65% saying they visit at least once per week. Of course this survey polled those who were already at a library’s website, so this skews higher compared to broader surveys we’ve shared before (such as those from Pew Research). Interestingly, respondents split 50-50 on whether they visit the library (again, in person or online) with a particular title in mind or without a title in mind. Split about a third each, respondents said they’d be willing to wait “as long as necessary” for a title (34%) or up to a month (32%). Perhaps most helpful to libraries is that if users are not willing to wait for a title, a majority (65%) said they wouldn’t buy the book instead. Users seem to understand the nature of library collections and that waiting is part of the process. Respondents also shared their typical methods of discovering both physical and digital books. More than half (53%) said they only found books in a digital setting while 16% only found books in a library or bookstore (physical setting). About a third (31%) relied on both digital and in-person options to find books. Learn more about how Overdrive’s survey respondents reading and library habits with the full report here. As the variety of program topics increases in public libraries, financial literacy training has emerged as a common topic in many libraries, especially since the recession. Financial literacy training seeks to educate and provide strategies about how to manage one’s money and prepare for financial planning. 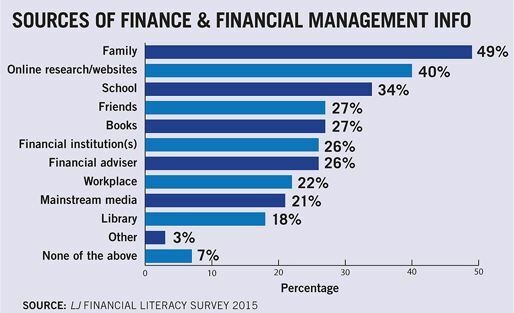 Yet Library Journal’s 2015 Financial Literacy Survey suggests that these services are not being used by cardholders as much as they could be. Out of 10 options, libraries ranked last as a source of financial information among the 1,466 library cardholders surveyed across 230 libraries. Just under one-fifth (18%) of those surveyed ranked it as a possible source, even though well over half (61%) of librarians surveyed said that they offered financial services. Library Journal proposes that the biggest challenge to public libraries is actually getting the word out about financial literacy training, since their survey indicated that more people would likely attend these events if only they knew about them. More than half (55%) of those surveyed said they would be willing to attend financial programming if they knew about it, and in addition to that an overwhelming majority (87%) said they trust financial information they receive from public libraries. The good news is that any public library can create financial literacy programming that is both inexpensive and appeals to patrons. One librarian surveyed was able to put on a week-long programming event for just $200. The survey also found that programming that integrated financial training for children saw higher attendance, a proactive strategy that helps to develop financial literacy early on in life while also opening up conversation among adults. Get ideas for how your public library can jump-start its financial literacy programming, and read the full report, here. Congratulations to the 7 Colorado Star Libraries for 2015! Although a few libraries that were Colorado star libraries last year are no longer represented on the list, Holyoke/Higenbotham is a new addition to the star library cohort this year. The LJ Index, which is used to determine star libraries around the country, is a measure that compares public libraries with others that have similar expenditures based on the output measures of circulation, library visits, program attendance, and public internet computer use. Output measures (as opposed to other measures used for library assessment, inputs and outcomes), are quantifiable measures of various services that the library renders. These outputs are based on data provided by public libraries in the IMLS Public Library Survey. The kinds of outputs measured by the LJ Index have begun and will continue to change over the next several years. For example, the 2015 star library ratings are the first to include e-circulation as part of its measures, and the 2016 ratings will be the first to account for all reference transactions, including virtual. This is an attempt to control for the fact that many library visits and services today are virtual as opposed to physical. Another factor that will affect the star library ratings in the coming years is increasing competition; more libraries than ever before, a whopping 7,663, were scored on the LJ Index in 2015. This year’s report also includes a handy how-to on DIY LJ Index projects, so you can figure out how to leverage the index data to evaluate how your library stacks up against its peers. Whether or not your library was named a star library this year, you can find all of the data here. 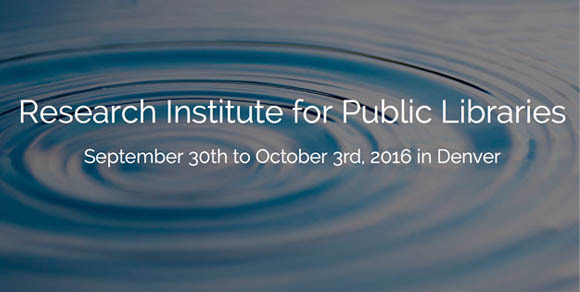 Are you interested in attending the 2016 Research Institute for Public Libraries (RIPL)? Do you have facilitation skills that you want to use at RIPL? RIPL is designed to be an immersive and highly participatory learning experience, and RIPL facilitators play a vital role in insuring that participants are actively engaged in the hands-on activities and discussions that occur throughout the institute. Facilitators are assigned to groups of 6-7 participants, and they sit with their groups during general sessions and some meals to facilitate group work. Groups change several times during the institute, so facilitators will work with 2-3 groups across the 3-day event. RIPL facilitators have the full participant experience. Facilitators will participate in the same sessions as everyone else, be able to choose which breakouts to attend, etc. The only difference is that facilitators will have some added benefits and responsibilities, as described below. Reduced registration fee: $1,165 (20% discount). This fee includes the curriculum, three nights lodging, and most meals. Guaranteed spot at RIPL 2016. Attending two 60 minute pre-institute webinars to learn more about the facilitator role and to become familiar with the group work that instructors have planned. Reviewing any discussion guides, activity instructions, etc. that instructors provide ahead of time. Sitting with their assigned group (6-7 participants) during general sessions and some meals and facilitating discussions, learning activities, etc. Connecting the members of their group with RIPL instructors/staff if they have questions or want to discuss topics that they aren’t able to address. Connecting with other facilitators at touch points in the institute as necessary. Providing feedback at the end of the institute about their facilitation experience. To be considered for a facilitator position, you must submit an application by 6:00 pm MST on Friday, December 11, 2015. Learn more about the application process and access the online application form here. Applicants will be notified of their acceptance status before the end of December. Committed to leading his/her organization in making data-based decisions. Special consideration will be given to applicants working in small or rural libraries and/or those working with underserved populations. However, staff working in any Colorado public library and/or Colorado residents enrolled in an MLIS program are encouraged to apply for scholarships. For more information and to apply, please see http://www.lrs.org/research-institute-for-public-libraries-2016-colorado-scholarship-information/. Scholarship applications are due by 5 PM on Friday, November 13, 2015. The Digital Inclusion Survey recently released new data and issue briefs that deal with a wide range of technology based services in public libraries, from access to e-government. The survey tracks trends and advances in the “access, adoption, and application” of digital resources in their effort to promote the importance of equitable technology access to the future of communities. Their issue brief on digital literacy reports that 9 out of 10 public libraries in the U.S. (90%) at least offer training in general Internet usage. In fact, there is little gap in the number of libraries that provide basic technology services in suburban areas (93%) and those that do so in rural areas (87%). Public libraries today have an average of 19 public access computers (including laptops), and many trainings now include workforce development and mobile technologies. Overwhelmingly though, libraries favor informal point-of-use interactions – four-fifths (79%) of libraries indicate they use this method, compared to the 39% that offer formal trainings. Yet public libraries are not without challenges in providing digital literacy service to their communities. A lack of infrastructure, funding, and staff expertise can all be major hurdles. For example, the Digital Inclusion Survey found a direct association between libraries that had undergone major renovations in the past year (21% of public libraries) and their ability to provide technology training. Attention to the space of the library itself, it seems, may be an indicator of the energy and assets put into emerging digital services. You can access all of the Digital Inclusion Survey’s 2015 issue briefs here.